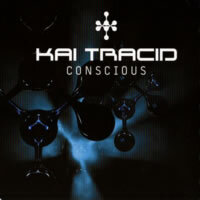 Kai Tracid had a pretty good run of success with his unique blend of acid and trance styles into one package. With three albums and a slew of singles under his belt, he was destined for good things in the industry. Sadly, after the third album, he pretty much tapered off for his own reasons, with the 2004 single "Conscious" being his final trance & acid swan song before mostly distancing himself from the scene aside from a few more minimal tracks (and opening a yoga studio in 2009). This single package begins with the Video Mix, ominously beginning with eerie vocals — "Now that I'm here... breaking my relationship with time and space..." Okay, I really have no clue what that means. You can't just wake up one morning and say, "I've had it up to HERE with space! I'm SO out!" and then just wander off into whatever non-space happens to be. The focus at first is trance, and the song starts out sounding very much like his previous hits. In fact, once the acid bass kicks in (as continuous overly pretentious spoken words spill out like spaghetti sauce), I find that this one sounds a bit TOO close to previous songs like "Life Is Too Short" or "Too Many Times", except with a more thickly poured saw synth. Later on, we also discover that whoever this voice is, they have left their physical form behind. How do you DO that without being dead? "I should have lived my life much more conscious." Grammatically correct or not, I suppose this means she wishes she had spent less time being unconscious, and I understand that. Being in a coma really is rough. Overall, the song isn't unbearable; it's the acidic instrumentation that really keeps me listening at all. The vapid introspective lyrics just don't do it justice. If you want a more elongated version of this, the Energy Mix is mostly the same, just with all parts extended and slightly rearranged. There are a few remixes in this package as well. The Kan Cold Remix is a bit glitchier with plenty of blips and boops to keep the techy fans happy before veering into hard trance territory with a far more reverbed main synth to keep the melody sounding rough 'n tough. The Ferry Corsten Remix also is filled with computer-esque sound effects and a heavy focus on the vocoder, as this was his primary genre interest at the time (this was during his electro phase when songs like "Rock Your Body Rock" and "Punk" were hitting highs). The instrumental aspect has zero relation to the source material but still piques interest, putting the focus more on the vocals this time. Not a bad spin on the original. Lastly is the A*S*Y*S Remix, and when A*S*Y*S is in town, you know some hard acid is going to drop... musically, that is. Though it takes a couple of minutes for this tune to get going, the hard bass whips will tear up a dancefloor like a rampaging piece of farm equipment on, well, a dancefloor. Acid poings keep things going, as well as glitched vocals. A*S*Y*S also modifies the melody a bit for freshness sake, all the while creating a vicious banger that could make small animals and children cry. Conscious as a whole is not a bad collection of songs. There's more than enough variety for the electronic music enthusiast. I just wish Kai Tracid had picked a better vocalist and perhaps toned down the cornball spoken words. Then again, it's a recurring theme in his music to add these things; previous songs by him have openly discussed excessive drug use, suicide, and the short length of our lifespans. Give Conscious a spin, but don't take it as seriously as he may have intended. It's a shame this was basically Kai Tracid's swan song single, though. He had potential to go farther.